On Tuesday night, CHP leader Kemal Kılıçdaroğlu made a marathon two-hour appearance on CNN Turk, the news network belonging to the Doğan conglomerate. Unlike President Recep Tayyip Erdoğan’s interview last week, this programme was not simulcast to the 3.4 million people watching Doğan’s mainstream entertainment channel Kanal D that night. They were instead treated to the first episode of Kara Yazı, a drama – appropriately enough, you might say – about a blood feud between families. 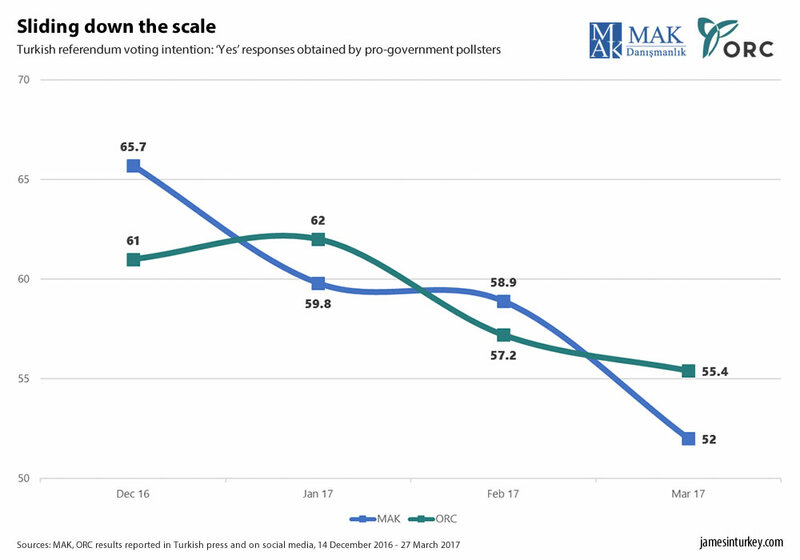 It illustrates the challenge faced by the opposition in Turkey’s constitutional referendum campaign: more than ever before, they are struggling to find airtime. Take the state broadcaster TRT’s news channel, TRT Haber, where the picture is bleak, according to figures published by Cumhuriyet, an opposition newspaper. In the first three weeks of March, President Erdoğan, the governing AK Party and government officials were given 68 hours, 37 minutes of airtime on TRT Haber, the report said. The CHP received 3 hours 36 minutes and the pro-Kurdish HDP was covered for just one minute. We are the stage where it is remarkable that any mainstream broadcaster chose to give Mr Kılıçdaroğlu a slot at all. Don’t bet on the government-friendly A Haber making a similar gesture. Part of this is because election broadcasting rules have changed. The YSK, which runs elections in Turkey, was last month stripped of its limited powers to fine television channels for unbalanced coverage. A Haber was a prominent victim during the last election; it’s unlikely to part with much cash this time. And yet this referendum doesn’t feel like walkover for the Yes side. The polls – including our tracker – remain very narrow and even pro-government pollsters have shown a significant drop from the sky-high Yes votes they projected earlier this year. This referendum is being fought on exclusively the right wing of the Turkish political spectrum. The right is a field encompassing pious Anatolians, hard-line nationalists and pious Kurds that has historically accounted for around two-thirds of the population. The AK Party’s successful strategy in ten national elections since 2002 has been to convince enough of this disparate field to win the most votes. The Turkish left is overwhelmingly opposed to an executive presidency but, as a minority in the electorate, does not have the numbers to secure a No vote. That is why the CHP, which calls itself a centre-left party, has been markedly right-wing in tone. In recent weeks the mild-mannered Mr Kılıçdaroğlu has called for a full suspension of diplomatic ties with the Netherlands, expressed condolences on the anniversary of a far-right leader’s death and implied a Yes vote will result in millions of Syrian refugees being granted Turkish citizenship. Mr Kılıçdaroğlu has also been at pains to avoid a verbal boxing match with Mr Erdoğan, even though the president has been trying to push his buttons. The CHP leader came “meekly” to the multimillion-dollar presidential palace after declaring he would boycott it, Mr Erdogan told crowds at the weekend. He has also repeatedly called Mr Kılıçdaroğlu a liar. Yet Mr Kılıçdaroğlu’s responses have always been polite and never forgetting to refer to Mr Erdoğan as “Mr President”. Even when asked on CNN Turk if he would invite the president to his son’s upcoming wedding, he shifted slightly uncomfortably in his seat before saying that decision was up to his son and future daughter-in-law – but he did add that he preferred smaller weddings over grand hall affairs. This strategy may seem like constantly squeezing a stress ball, but it does back up what Gürcan Dağdaş, a former nationalist minister and MHP member of parliament, told internet TV channel Medyascope last week. Interviewed by journalist Ruşen Çakır, Mr Dağdaş said this is a referendum being fought in the right’s neighbourhood and the right-wing will determine the victor. But with polls on a knife-edge and a rebellion in Turkish nationalist parties that is very difficult to gauge, the outcome is still anyone’s guess.